Inject-Safe™ Barrier Bandage is a self-adhesive bandage applied to a patient’s skin before an injection by a healthcare provider to contain the post-injection bleeding. This injection bandage is a non-coring self-sealing elastomeric membrane and adhesive spacer with an opening to allow a needle to puncture the membrane and pass into the skin. It is intended for use in subcutaneous and intramuscular injection procedures to contain any post-injection bleeding. Following the procedure, the needle is removed through the elastomeric membrane without any blood on the needle and any blood on the skin remains inside the membrane. The bandage is then discarded after hemostasis. 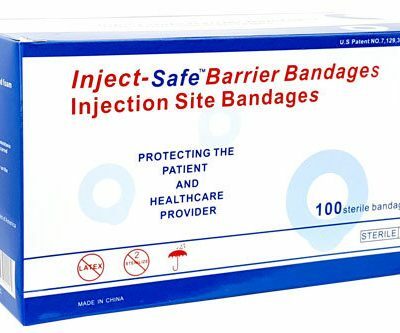 The Inject-Safe™ Barrier Bandage is a patented “pre-procedure” self-adhesive injection bandage that would be applied to a patient’s skin PRIOR to being given an injection by a healthcare provider for the purpose of containing any post-injection bleeding. Bandage from the sterile pouch. 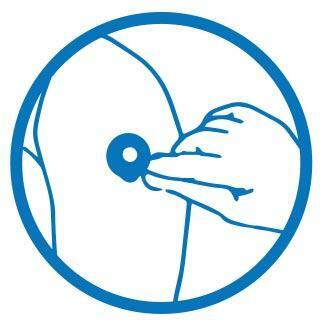 Hold the tab on the Inject-Safe™ Barrier Bandage and remove the paper backing. the membrane area of the Inject-Safe™ Barrier Bandage. 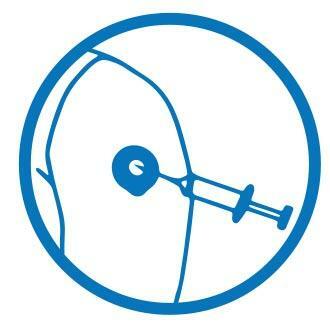 Inject needle through the center of the Inject-Safe™ Barrier Bandage. 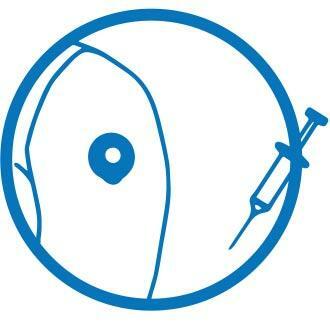 Remove and safely dispose of the needle in a sharp container. 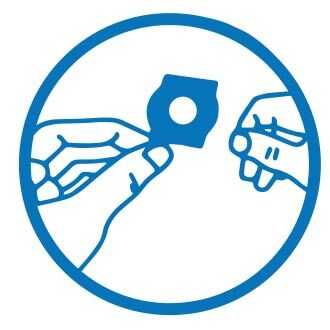 *When the needle is removed, the Inject-Safe™ Barrier Bandage self-seals and protects both the patient and healthcare provider from possible exposure to blood from the injection site. The bandages self-seal to help contain bleeding following an injection. Consistent with “Universal Precautions” established by OSHA. Protects the healthcare provider from coming into contact with potential bloodborne pathogens. Meets OSHA Bloodborne Pathogen Standard’s definition of “Engineering Control,” for use to reduce employee exposure to a patient’s blood at the site of subcutaneous or intramuscular injection. 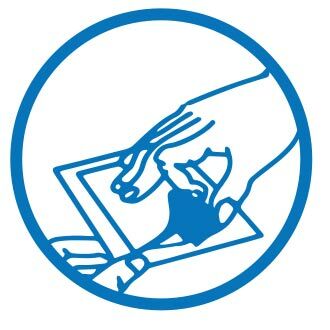 Allows healthcare provider to use both hands to dispose of the needle. CONTACT US FOR YOUR FREE SAMPLE! Offer available for Canadian pharmacies & Canadian healthcare providers only. Thank you for subscribing to our newsletter! An activation email has been sent to the email address you registered. All our toilet drops & toilet sprays products are environmentally friendly and safe for septic systems. We are one of the safest alternatives on the market! Estimated delivery for Canadian orders: 5 to 7 business days. Estimated delivery time for international order: 4 to 6 weeks Tips for saving: Combine multiple items or multiple orders for you and your family.